A broken heart can feel very real for those experiencing the loss of a loved one or significant other. But for some, the emotional stress does quite literally break their heart — at least temporarily — causing symptoms that can mimic a heart attack. Broken heart syndrome is one of the many names for takotsubo cardiomyopathy, a rare and temporary condition where part of a person's heart suddenly becomes weakened or 'stunned' — forcing the rest of the heart to work harder. When this happens, the heart's left ventricle changes shape, developing a narrow neck and round bottom. The shape created by this bulging out earned the syndrome the name 'takotsubo', meaning octopus, in Japan where the condition was first reported. The condition is also referred to as acute stress cardiomyopathy and apical ballooning syndrome. There are various theories as to what causes the condition. About three quarters of those diagnosed with Takotsubo cardiomyopathy have experienced severe emotional or physical stress prior to becoming unwell, such as bereavement. British Heart Foundation (BHF) says evidence suggests the sudden, excessive release of hormones — usually adrenaline — during these stressful periods causes the 'stunning' of part of the heart muscle. Interestingly, research conducted by Imperial College London in 2012 found the condition may actually protect the heart from very high levels of adrenaline. Professor Sian Harding, from the National Heart and Lung Institute (NHLI) at Imperial College London, who led the study, explained: "In patients with Takotsubo cardiomyopathy, adrenaline works in a different way and shuts down the heart instead. This seems to protect the heart from being overstimulated." People experiencing takotsubo cardiomyopathy will often have chest pains and breathlessness similar to those seen in a heart attack, according to the British Heart Foundation (BHF). However, the survival rate for those who are discharged from hospital after suffering from the condition is nearly 100%. Amy Thompson, senior cardiac nurse at the BHF, said: "Its symptoms can mimic a heart attack, but it causes no permanent damage to the heart — it is both temporary and reversible." 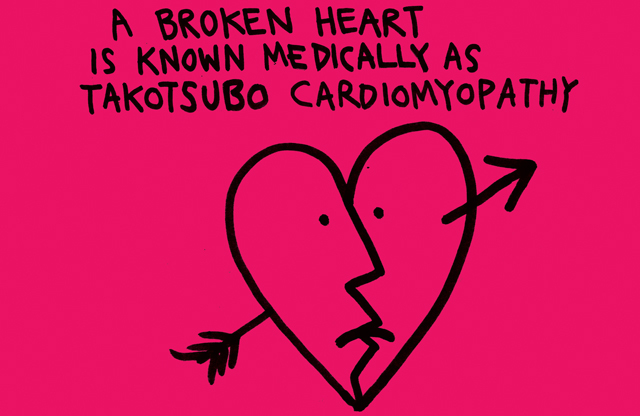 The BHF estimates that takotsubo cardiomyopathy affects 2,500 people in the UK each year. Between one and two per cent of people who are initially believed to have had a heart attack are found to have experienced the syndrome at a later date, according to Imperial College. Dr Alexander Lyon, a consultant cardiologist at the Royal Brompton, said that more people may be dying suddenly of the condition before reaching hospital without it being accurately diagnosed before or after their death. He said this can be particularly difficult with men who may have died from the syndrome. "The pathologist opens the heart, sees some signs of coronary artery disease, because in western society pretty well all adult men will have evidence of it, and so records coronary heart disease as the cause of death," he explained. "And with deaths in custody, we know that hearts are very often normal when examined, so this syndrome becomes relevant. It may be happening far more often than is reported." The Johns Hopkins University School of Medicine said that out of women in their research who were being examined for heart abnormalities in a catheterization lab, between five and seven per cent will be diagnosed with broken heart syndrome. Thompson said some studies suggest the syndrome affects women more than men. "Further research is needed to fully understand this rare condition," she added.